1975: Another World expanded to an hour full-time. 1983: Felicia Gallant arrived in Another World's Bay City. 1986: General Hospital's Monica was at odds with Alan. 1997: Aaron Spelling's Sunset Beach premiered on NBC. "History speaks to artists. It changes the artist's thinking and is constantly reshaping it into different and unexpected images." 1966: On Peyton Place, Rodney Harrington (Ryan O'Neal) visited Allison Mackenzie (Mia Farrow) at Doctors Hospital. She had told Rodney she loved him on the day of his arraignment but she no longer remembered her feelings for him. The episode was written by Sonya Roberts and Rita Lakin. Lakin went on to become head writer of daytime soap opera The Doctors. 1967: On Dark Shadows, Laura (Diana Millay) and David (David Henesy) looked at the photo album Roger (Louis Edmonds) gave him, and she told him about where she comes from, which some people called 'Paradise.' Laura told David about the beautiful, immortal Phoenix, which didn't age for 100 years and of which there was typically only one on Earth at a time. Victoria (Alexandra Moltke) listened secretly. As Laura's story climaxed, the doors to Collinwood burst open with a ghostly wind and revealed Victoria standing there. 1972: On The Doctors, hospitalized for an EEG and a brain scan, Dr. Maggie Powers (Lydia Bruce) asked Dr. Carl Hendryx (Edmund Lyndeck) what could be wrong with her if she didn't have a brain tumor. 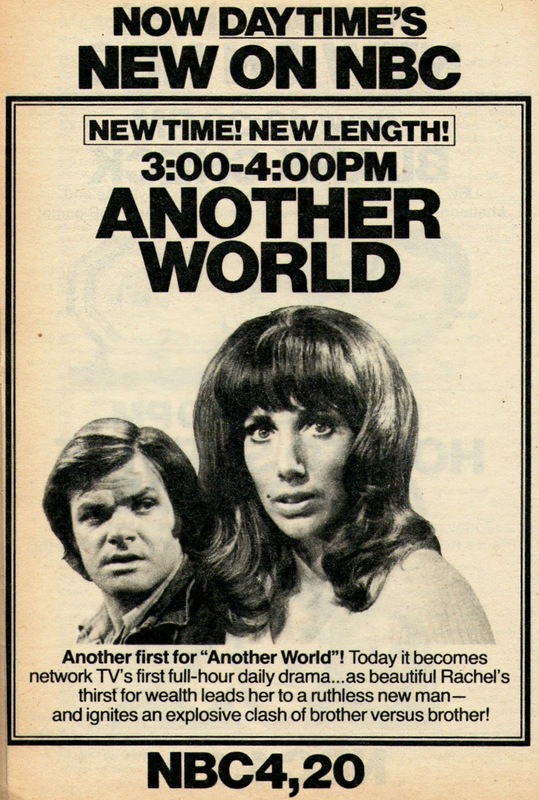 1972: On The Edge of Night, Liz (Alberta Grant) phoned Jim (Alan Feinstein) to say she was on her way back to Monticello with Orin (Lester Rawlins), who stared blankly ahead from his wheelchair..
1975: Another World expanded to an hour full-time, the first daytime soap opera to broadcast 60-minute episodes five days a week. On May 3, 1974, the show aired a one hour special featuring Steve and Alice's wedding. It performed well in the ratings leading to NBC's decision to expand the show to an hour daily. In that day's episode, Liz (Irene Dailey) told Alice (Jacqueline Courtney) it was all over between her and Mac thanks to Rachel. Iris (Beverlee McKinsey) promised Mac (Douglass Watson) to do everything she could to make Rachel feel comfortable. Rachel (Victoria Wyndham) agreed to let Mac handle Jamie's visits with Steve. Robert (Nicolas Coster) and Lenore (Susan Sullivan) spied on them from across the restaurant as Mac told Rachel that after many lonely years he had found in her something to look forward to. 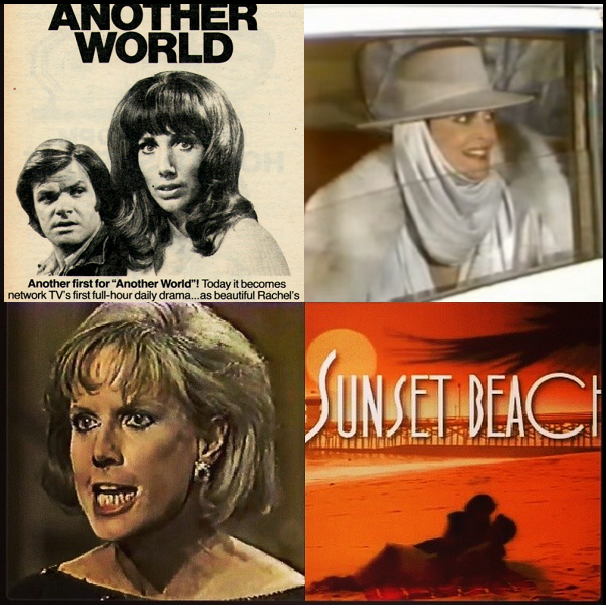 1983: Linda Dano debuted as Felicia Gallant on Another World. 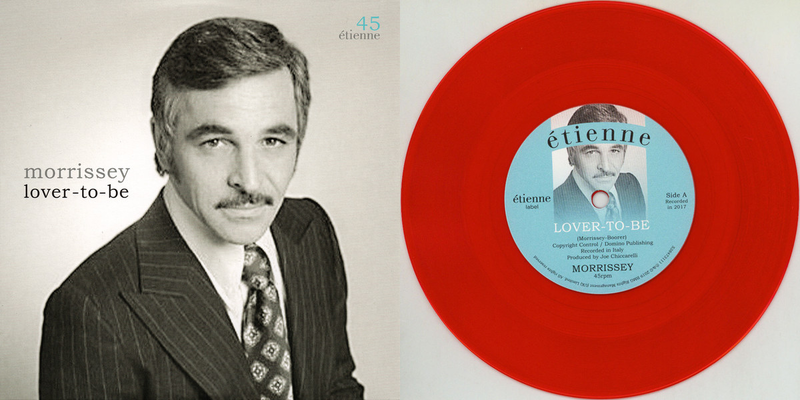 1986: On General Hospital, Alan (Stuart Damon) grabbed Monica (Leslie Charleson) and tried to kiss her. She angrily told him to keep his hands to himself: "You keep your hands off me until I say I'm ready! You got that?". Meanwhile, Bobbie (Jacklyn Zeman) was kidnapped and held hostage in Laurelton. 1987: On Guiding Light, Alexandra Spaulding (Beverlee McKinsey) remembered good and bad times with Simon Hall (Shawn Thompson), who left Springfield. 1988: Actor Brent Collins died at age 46. He starred as Wallingford on Another World at the time of his passing. He previously had played Mr. Big in As the World Turns. 1992: On The Young and the Restless, Jack (Peter Bergman) demanded Nikki tell him what it would take for her to give up booze. Jack stormed out in frustration saying, "Victor! Victor! I've had it up to here with Victor!" 1997: Actor Vince Williams died at age 39. He was best known for his work as Hampton Speakes in Guiding Light. He also played Lamar Griffin on As the World Turns and Joe Morgan on Loving. His final role was Dustin Carter on Another World. Meg left Kansas and moved to Sunset Beach. 1997: Aaron Spelling daytime soap opera Sunset Beach premiered on NBC. Fresh-faced Kansas girl Meg Cummings (Susan Ward) ditched her husband-to-be in favor of a mysterious Southern California man she met on the Internet, and traveled to the picturesque coastal town touched by romance, murder, misunderstandings and nefarious schemes in equal measure. The original cast included Lesley-Anne Down, Sam Behrens, Clive Robertson, Sherri Saum, Randy Spelling, Jason George, Timothy Adams, Sarah Buxton, Hank Cheyne, Ashley Hamilton, Kathleen Noone, Nick Stabile, Kelly Hu, Vanessa Dorman, Peter Barton, Adrienne Frantz, Leigh Taylor-Young and Laura Harring. Gary Tomlin, the executive producer, who had 20 years experience as a daytime actor, writer and director at the time, was chosen by Spelling to run the show's day-to-day operations. "The pace of our storytelling is slightly faster than on other shows," Tomlin said in a 1997 interview with The New York Times. "And with all the location shooting on the beach, we look different than shows that are shot mainly in the studio." Sunset Beach ran until December 31, 1999. 2009: Taylor Spreitler debuted as Mia McCormick in Days of our Lives.